The big concrete and steel pill box BP was banking on to plug the oil gushing into the Gulf of Mexico failed after hydrate-like crystals formed blocking the top of the dome and making in buoyant. Not crazy. The technique ( usually known as “top kill” ) was used to extinguish some of the 1990-1991 Gulf war fires. The injected “junk” accumulates at restrictions and blocks the flow. 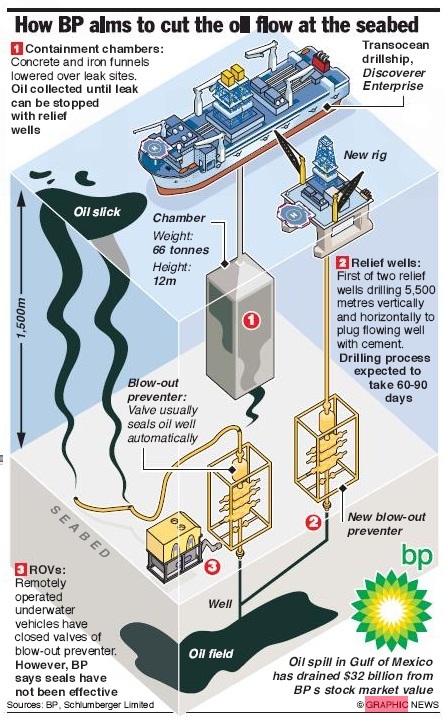 The technique has ( AFAIK ), never been used on sub-sea wells, and it assumes that the kill and choke lines on the Blowout Preventer are available – hence removal of the BOP controller for reconfiguration before trying the method. They would need to also pump mud quickly into the well to reduce hydraulic stress on the well head, because oil/gas coming up outside the 36″ upper casing would be a much larger disaster. Visibly Shaken gathers together some of the best science-related infographics and visualisations from around the world to inspire and educate.